Thanks so much to Amy at Novel Gossip for having me on her lovely blog. This was part of the Secrets We Keep blog tour and she was good enough to read and review the book for us. And here’s Amy’s post and gorgeous review — such a super review Amy, I loved it! 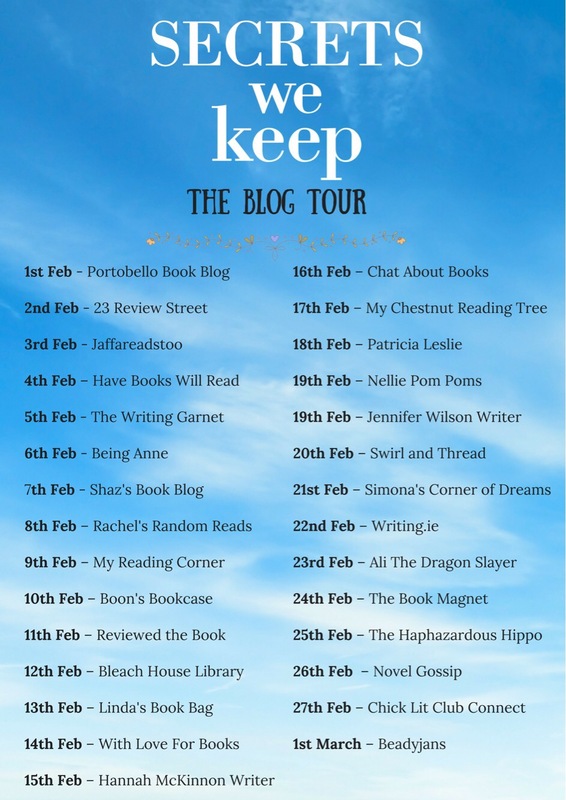 Welcome to my stop on the blog tour for Secrets We Keep. I loved this bittersweet story of love, loss and family secrets! This was an utterly gorgeous story about two women that need to face their demons and move on from past mistakes. Speaking of gorgeous, that cover is stunning! Kate is a successful lawyer from London who decides to visit her aunt and uncle in the quaint and charming town of Ballytokeep. Iris is the aunt and she’s been married for over fifty years and runs a hotel with her husband. Both women had some painful moments in their past that they’re trying to recover from and both have been heartbroken in a tragic way. When Kate arrives in town she is immediately swept away by the vast beauty of the town, but mostly she’s enchanted by the old bathhouse and decides on a whim to renovate it and leave her old life behind. As these two estranged relatives begin to get to know each other, old secrets come to the surface and they discover that maybe secrets aren’t meant to be kept. This is told primarily from Kate and Iris’ point of view, Kate in the present day and Iris in both the past and in the 1950’s. Two men also narrate a few important chapters; Todd an aging rockstar who is a typical bad boy in the present day and Robert a charming young man in the past. I loved the back and forth, the chapters from the past gave this a historical feel and as I kept reading I was eager to see how past and present would collide. Both Kate and Iris were easy to like, you could easily imagine being friends with either of them. Iris is a loving wife to her husband Archie, she’s a natural caretaker and a has a doting personality. Kate is worn out from her high profile lifestyle and craves peace and her first chance at a real family connection. The setting was breathtaking, Hogan’s writing style conjured up rich and vivid images of a seemingly idyllic place. I know Ballytokeep is a fictional place, but that didn’t stop me from longing to visit the bathhouse! Family secrets never fail to hook me and there were many unexpected moments as these mysteries were revealed. Reading this was like a breath of fresh air, I was captivated by the story, the writing and the lovely characters. Hogan infused so much warmth into this book even during dark moments and I was both satisfied and sad when I finished, but only because this beautiful book was over. Thanks to the author and Aria Fiction for my review copy. 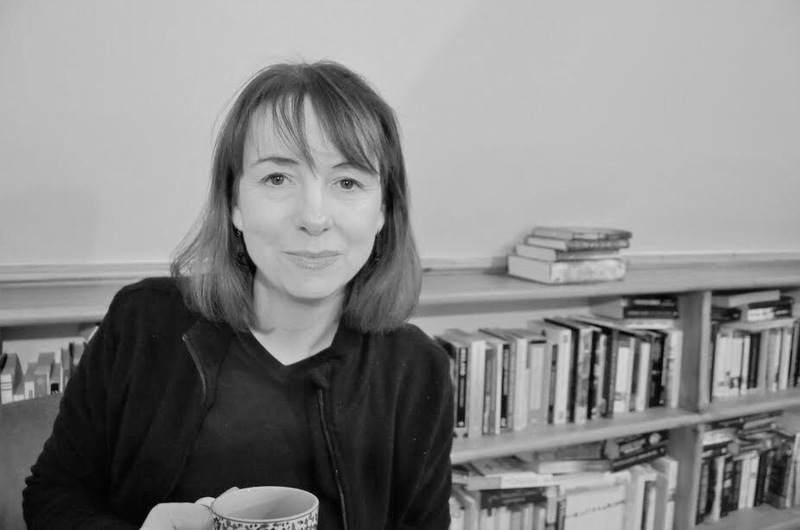 Her debut novel, ‘My Husband’s Wives,’ is a contemporary women’s fiction novel set in Dublin. It was published by Aria, (Head of Zeus) in 2016. 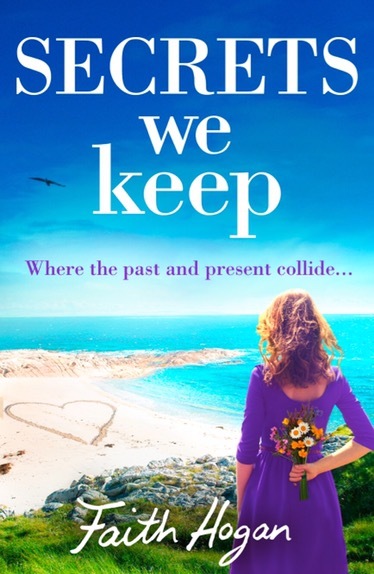 ‘Secrets We Keep,’ is her second novel out on Feb 1st 2017. Family and secrets, an explosive but gripping mix!  Great review!